Yesterday and today I needed outfits that would be warm enough for coooooold hospital/clinic appointments*, but then easily made cooler for work immediately following since it's hooooot and there's no AC at my work. I really want to be wearing wearing wearing all my new fab dresses with the lovely weather we've got, so popping pants underneath felt like the best option! Fun colors and patterns chosen for Good Clothing Energy Vibes. Both dresses were super in the heat, and the layering worked out really well; was a little concerned the pants might be a fussy change but it was easy peasy. Quick-and-dirty run down of each outfit and stages in #1/2, and more angles etc. in #3-6 (too many photos, maybe!). Comments, critiques, thoughts and questions welcome. Totally loved Mirjana's recent light blue/soft gray/black outfit and wanted to copy right away. I knew I had the gray cardigan, black ballet flats and light blue jeans so figured it would be easy... Then realized I don't have any non-printed black tops, nor navy or even any other solid dark color which would work with the cardigan (this is what happens with preference for light/colorful, I guess!). This black and gold crane tee was as close as I could get, which then lead to the loafers over ballet flats because I liked the vibe. 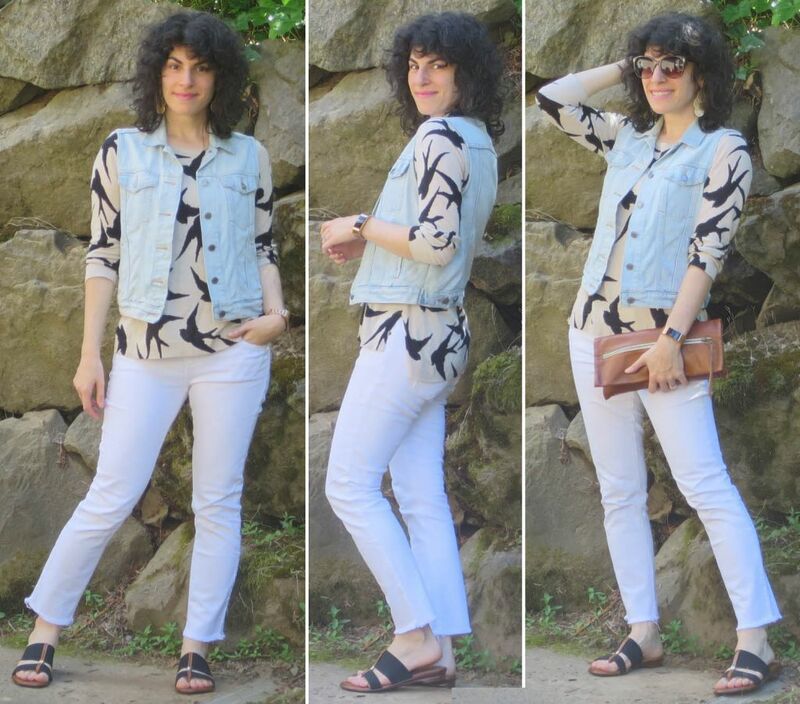 Don't think this outfit has the lovely elegance of Mirjana's but hey it turned out fun, at least :) Certainly more casual which worked nicely for a weekend day of errand running. Thanks for the inspiration Mirjana! I looove the color combos Angie showed in her formula post this morning! Especially with white added in. 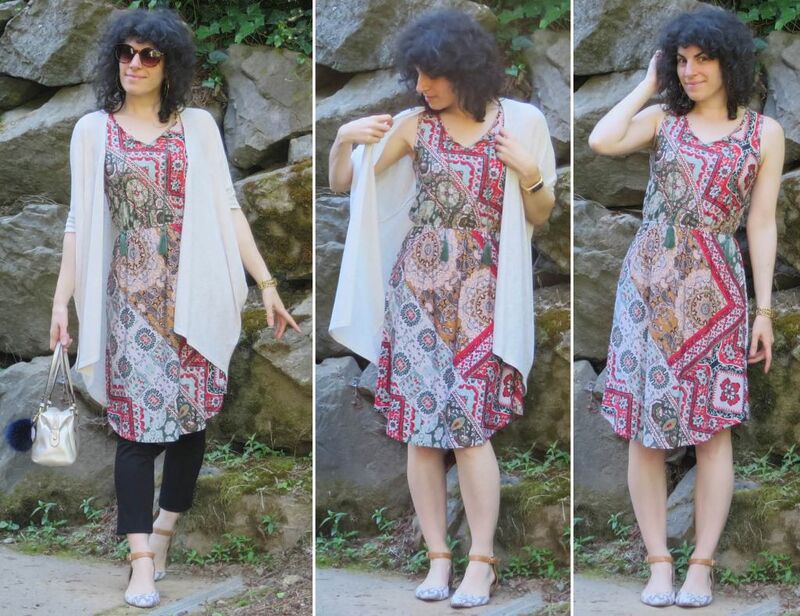 This is an easier formula to pull together in winter, as noted might be the case in the blog post; for summer I can swing taupe/cognac and pale aqua -- or on cooler days, like today (though it turned out much less cool than I expected! ), I can use faded blue denim. Instead of looking primarily at color, for this art challenge I'm going to look more laterally for inspiration. The two main draws for me from this particular piece are space (vastness of the environment against smallness of the lone person) and, on a secondary level, signature (the description of Angus's style as flat/simplified colors, outlined elements, and "drawing with paint"). Fashion-wise it made sense to correlate "space" to "volume". While I was veerrryy tempted to simply go for a literal Maximum Volume Possible take, ultimately I decided that a wearable final outfit was more important ;) This one is still very voluminous, though! The culottes were a no-brainer as my most voluminous bottoms, plus bonus that the tuxedo stripes echo the vertical elements in the painting. 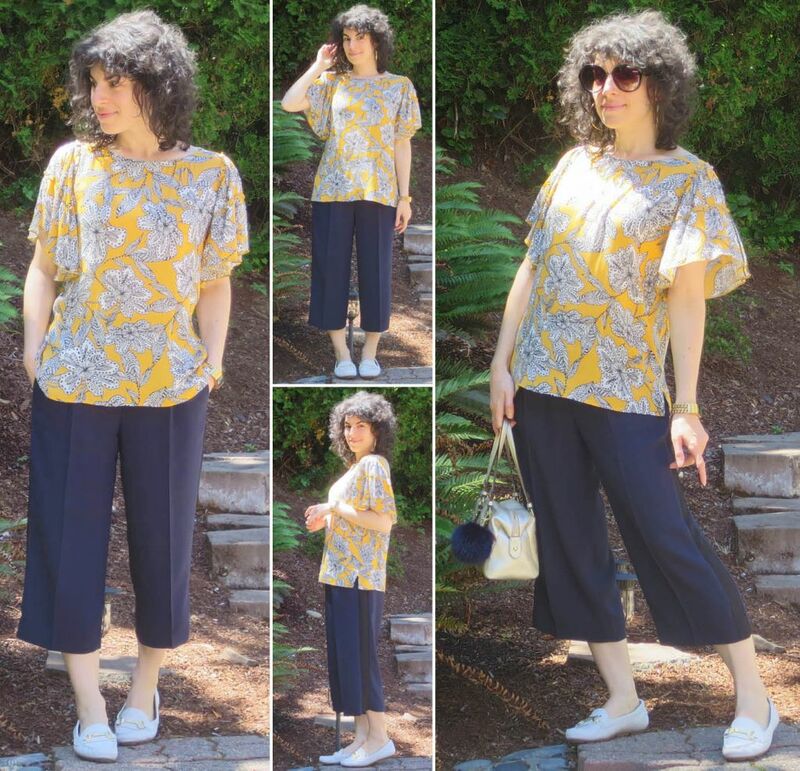 I picked this particular blouse because of the volume, color, the "ink drawn" look, and sleeve shape which echoes all the triangular geometry. Footwear considered only aesthetically, but upon later reflection I was amused that they are probably one of the few pairs I wouldn't wear in the environment depicted in the painting. 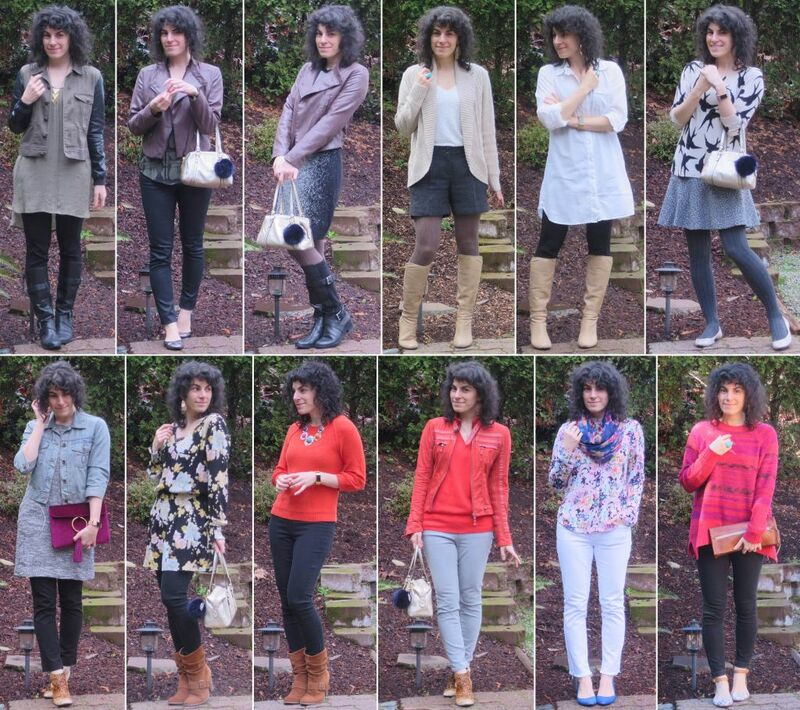 I took photos both tucked and untucked, and quite like them both though am actually wearing the untucked version. Tucked is definitely more traditionally flattering but I much prefer actual short tops over tucking these days. And while untucked is probably juuust at the edge of JFE, even with low-contrast flats, I'm really liking the funkier/artier/breezier vibe. 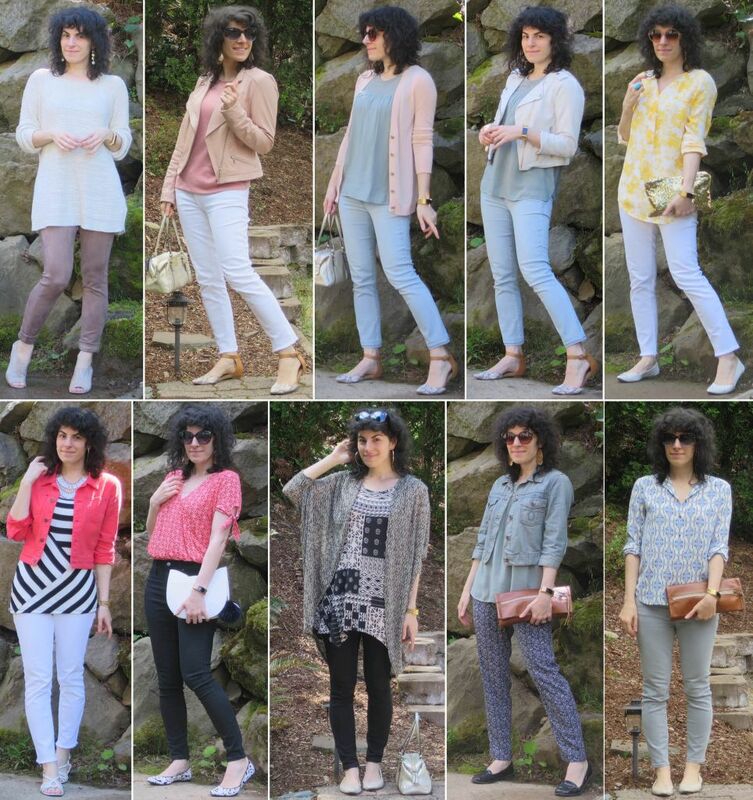 Aaaand a few cooler early spring favorites (that's all for now, don't worry!). Not expecting much more of this weather ahead until fall, woohoo! No spring purchases here but a couple from FW17: orange sweatshirt sweater, coral sharkbite sweater, oatmeal shawl cardi, black skinny jeans, plum plaid coat, and burgundy clutch. Since these were faves I was happy with the whole lot :D I was super pleased at my discipline for repeating high happiness outfits, like these, this past season instead of wearing new combos "just because." Plus it's a lot easier esp. on those days when my brain just isn't going! Newer pieces for SS18: taupe suede slim pants, pink ruffle sleeve tee, watermelon denim jacket, sage crochet-yoke tank, red faux wrap top, black/tan marled cocoon cardi, black/white patterned silky track pants, gold/blue stone earrings, ivory 2-tiered necklace. Pretty happy with all of these but absolute highest happiness: #2/3, #10, #11, and #4 has been a great weekend casual go-to. We recently had a lovely week of unseasonably hot weather -- in the mid 80s, which is a solid 20-30F degrees warmer than usual for this time of year here. 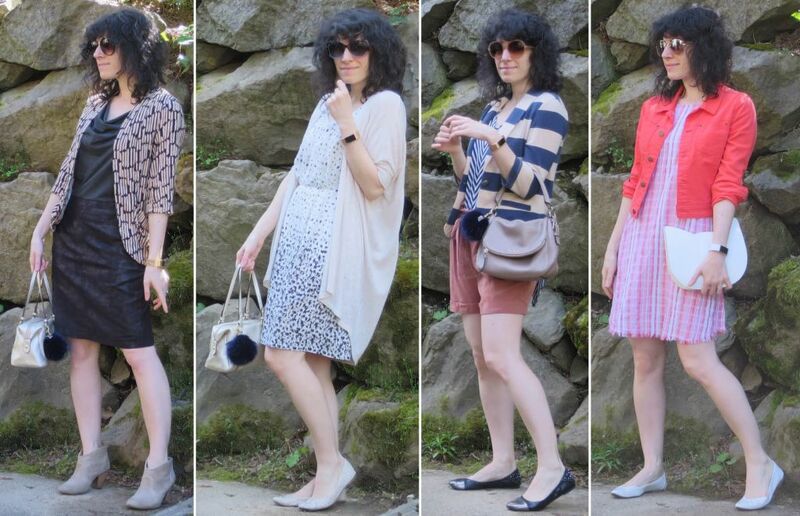 It was fun to pull out both old and new summer pieces, almost like a little summer test run. One of my summer goals this year is to wear dresses more but no worries I will continue to be a solidly representing member of Team Shorts. photo #2 has a new jacket, rest are oldies but goodies. Loved the vibe this outfit has, would like more of it. Can't really see them but worn with big hammered gold hoops (they're in the Finds). photo #3 is a go-to favorite outfit I've been wearing for a few years now (since 2015 maybe?). Updated with boho rose gold accents and new sunnies. photo #4 is a mix of oldies worn in a new (?) way. A little hectic ^^ A rare outfit accented with silver. Ended up a lot warmer than expected so I was mostly sans jacket. photo #5 is mostly newer (watermelon jacket, pink patterned dress). I got this cotton sack dress mainly for those really hot days when clothing just doesn't sound good and I think it will work really nicely for that! 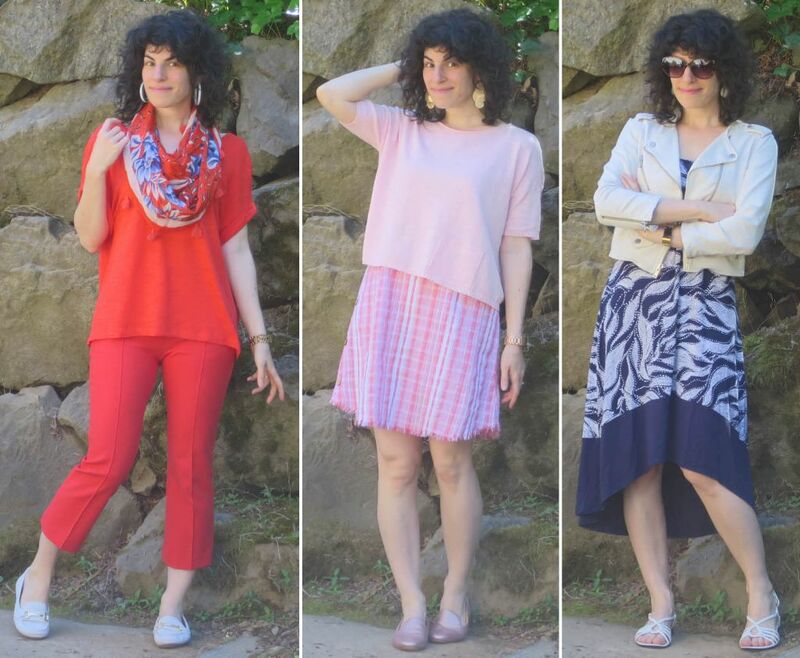 Yesterday I thought I'd try another version of duster+culottes for some unseasonably warm weather. 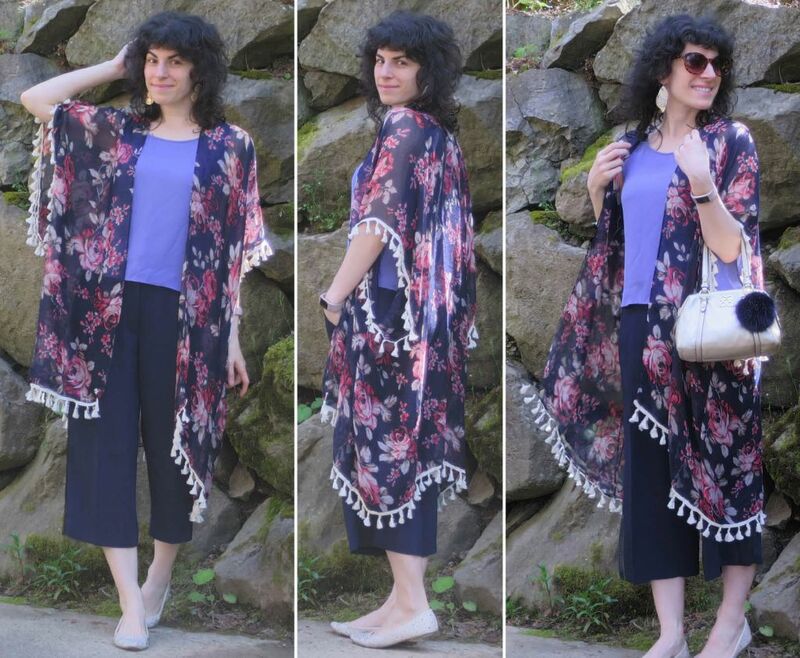 My initial purchasing thought for this semi-sheer navy duster was to wear with jean shorts and a breezy tank in high summer but this turned out pretty fun, too! This is definitely one of those outfits that is extra tricky to photograph since every piece has both volume and a lot of movement (and me too during photo time, apparently ><). I very much enjoyed all the swooshing around ^^ Maybe not everyone's cuppa with the flats -- it would certainly be more conventionally flattering with a little heel -- but I liked the more relaxed vibe the flats offered. Unfortunately the navy dye isn't quite set and rubbed off on various things throughout the day. Any tips on how to set it?